It breaks our heart to say it, but sometimes there can just be too much bacon. Everybody loves bacon. Bacon is like the food world's golden child and America's best friend. Bacon is so beloved it would seem it could do no wrong, but that would be a hasty assumption. Bacon can do a lot of wrong. Bacon has expanded from breakfast food to all-hours-of-the-day food. It's everywhere, and sometimes it's pretty gross. While we used to primarily see bacon on our breakfast plates, we're now seeing bacon in burgers, wrapped around dates as hors d'oeuvres and even on gourmet doughnuts. Bacon, you're more than welcome in these unexpected but highly appropriate places. But bacon, you're a treat, and you shouldn't be showing your face everywhere, in egregious amounts. You're a fatty, decadent, special food that is best in aggressive quantities. A little goes a long way, and a lot can just be kind of nasty. Before you get all fired up and tell us that there can never, ever be too much bacon, take a look at the kind of monstrosities we're talking about. 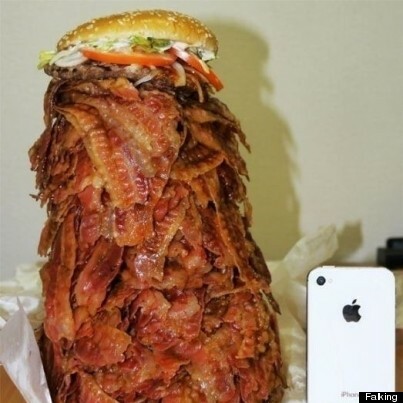 Yeah, that's too much bacon. We love bacon just as much as you do, which is why we don't want it to ruin itself in displays like this bacon burger. We all know bacon may have jumped the shark, and we're constantly trying to ignore the fact that it can get overplayed. But then new bacon items like these Bacon Choco-Tots come into the picture and remind us that bacon has limits just like everything else. We love a hot, sticky cinnamon roll. Keep the bacon out it. We also love tacos. No bacon necessary. Seriously, step away from the taco, bacon. First you're getting in our taco space, and now you're all up in our choco tacos. Because smelling like bacon is your ultimate goal? We don't want to take your business card in the first place, and now we definitely don't want it. We like bacon in our burgers. We don't like it holding our burgers together. Sorry, but we're not on board with bacon wrapped sushi. A bacon wrapped avocado implies to us that the avocado must be warm -- heated by the bacon. And this is not ok. We love bacon and avocados separately with all our hearts, but this could ruin both foods forever. Hot avocados, if you don't know yet, are the enemy. Go ahead, bacon. Ruin cake too. What must the bacon taste like after it's been soaked with beer? Don't say, "delicious." Excuse us while we go cry in a corner. There are more bacon houses than we wish to acknowledge in this world. So... besides the fact that this piece of 23-karat gold chocolate bacon looks like a literal piece of sh*t, it obviously shouldn't exist in the first place. Brace yourselves. This bacon explosion is very, very real, and we have the GIFs to prove it. It's made with crispy bacon, ground pork sausage, a bacon weave, barbecue sauce, and sometimes cheddar cheese. In case you were ever wondering what a bacon-wrapped alligator with a chicken in its mouth looked like, now you know. Nobody really knows where this beast came from, but everybody is horrified. Correction: This post originally featured a photo of a business card made of beef jerky when referring to a bacon business card. The photo has been updated.